Did the Trumps participate in the college admissions bribery scandal? There’s no proof that any of the Trumps cheated on their SATs, but that could be because there hasn’t been any investigation into this type of foul play up to this point. There is another way the Trump family could be cheating their way into university, though. M.O.N.E.Y. Let’s go back to the 60s for a moment, shall we? In 1964, Donald Trump was a student at Fordham University. Two year later, he transferred to the Wharton School at the University of Pennsylvania where he managed to graduate in 1968 with a BSc in Economics. Trump claims he graduated top of his class, but his name does not appear on the commencement announcement as a student on the Dean’s List, or one who graduated with any honors. Just another little white lie to make himself look better than he is, I guess. Fast forward to about 40 years later, and it appears that Trump may have pledged $1.4 million to the university. Interestingly, three of his adult children have attended the same school. Perhaps Ivanka could have gotten in without Daddy’s help, but could Don Jr? What about Tiffany Trump? 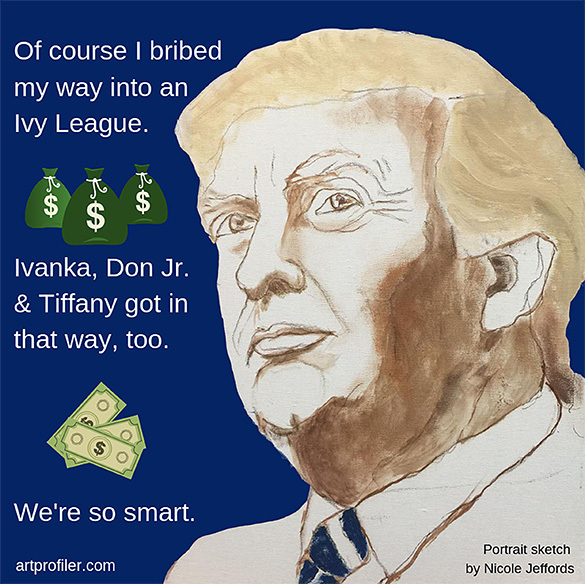 Are all three of these children really Ivy League material or is it possible that the Trump family, in addition to all of the other (now indicted) famous and wealthy people, took part in the college admissions bribery scandal? Interestingly, all three of the children are donors now, too. Guess they’re preparing to pay their own children’s way in… you know, just in case their SAT scores aren’t stellar.